An integrated services digital network (ISDN) is a structured all digital telephone network system that was developed to replace (upgrade) existing analog telephone networks. The ISDN network supports advanced telecommunications services and defined universal standard interfaces that are used in wireless and wired communications systems. ISDN provides several communication channels to customers via local loop lines through a standardized digital transmission line. ISDN is provided in two interface formats: basic rate (primarily for consumers) and high-speed rate (primarily for businesses). 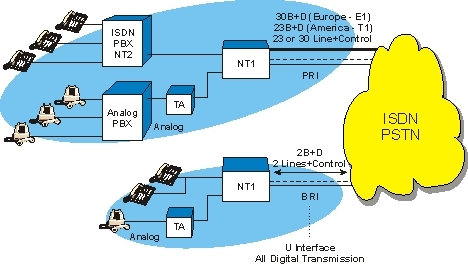 The basic rate interface (BRI) is 144 kbps and is divided into three digital channels called 2B + D. The primary rate interface (PRI) is 1.54 Mbps and is divided into 23B + D for North America and 2.048 Mbps and is divided into 30B + 2D for the rest of the world. The digital channels for the BRI are carried over a single, unshielded, twisted pair of copper wires and the PRI is normally carried on (2) twisted pairs of copper wire. This diagram shows the different interfaces that are available in the integrated services digital network - ISDN. The two interfaces shown are BRI and PRI. These are all digital interfaces from the PSTN to the end customer's network termination. Network termination 1 (NT1) equipment devices can directly connect to the NT1 connection. Devices that require other standards (such as POTS or data modems) require a terminal adapter - TA. This example shows that the NT2 interface works with the NT1 interface to allow the application layers (terminal intelligence) to communicate with the ISDN termination equipment.